My PASS 2011 Experience - Knowledge gained, vendor prizes, and meeting more people. You will find all kinds of vendors in the vendor hall, and pretty much all vendors give away some type of swag. Several vendors gave away an iPad 2 this year and there were also plenty of other really cool prizes. The only thing you need to do to be eligible for stuff (especially the big prizes) is to let them scan your badge. No big deal. Yes, you'll get some emails and phone calls from the vendors looking to drum up some business, but it's a small price to pay to be eligible for some awesome prizes. Spend some time meeting the vendors and you'll not only learn about cool companies and products, you may even be pleasantly surprised with taking home a sweet prize. At the very least, you'll have a blast meeting new people among the massive throng of folks wandering around all the vendor booths! I got up early on Thursday to head down to the hotel lounge with Mike Walsh (Blog - @Mike_Walsh on Twitter), Joe Webb (Website - @JoeWebb on Twitter), Andy Leonard (Blog - @AndyLeonard on Twitter) and about 20 others to worship and pray as part of the #PASSPrayers group. Rob Farley (Blog - @Rob_Farley on Twitter) played the guitar for worship. It was a great time of fellowship and the hour went by very quickly. Thursday was the day to recognize Women In Technology. It was also SQL Kilt day. Started by Grant Fritchey (Blog - @GFritchey on Twitter), Steve Jones (Editor of SQLServerCentral.com - Blog - @Way0utWest on Twitter), and Bill Fellows (Blog - @billinkc on Twitter) @ the PASS Summit in 2009, it's a way for the guys to show their support for the women that work in the technology field. Participation has grown in the past two years, and even several vendors got in on the act by wearing kilts on Thursday. It was great! I had breakfast in the hotel, hit the keynote, and then made my way to a session on branding yourself by Steve Jones. I found this session (Branding Yourself For The Dream Job) to be chock full of great information and it is the primary reason I'm blogging today. This session covered so much more than just how to look for a new job. I'm not currently looking for a new job, but I was able to use information from this session to set some goals for myself and update my resume (which I hadn't touched since I landed my current job almost 6 years ago). Again, community is the key. It's not just about trying to get your name out there so people will recognize you, it's about actively contributing to the SQL family. I chatted with Steve for a bit after the session (including thanking him profusely) and then made my way to lunch. After lunch, I finished registering for all the cool prizes I could find in the vendor hall. Dell offered a free 10 minute chair massage, which I definitely took advantage of. I was also able to meet with the president of my local PASS chapter and I joined on the spot. That afternoon, HP had an NDA presentation on their partnership with Microsoft to co-develop a data appliance. I found it very interesting, but it was Large Enterprise level technology that I won't get to play with. They had a drawing for an HP Mini if you submitted an evaluation form. I filled out a form, but I wasn't even thinking about winning the HP Mini. I was working on collecting and organizing cards for another HP prize drawing when they called my name. It took me several seconds to realize that they didn't have a question for me, but that I had won the HP Mini. To say I was excited would be a vast understatement. I gave the HP Mini to an old college friend that I hadn't seen in 12 years. He needed it far more than I. Early Thursday evening were all the vendor drawings. Before I go into too much detail, I need to stop and give kudos to the PASS Summit planning team. PASS does not allow vendors to do their prize drawings simultaneously. The vendor drawings @ TechED often occur simultaneously and thus you have to choose between vendors (and may miss out on a drawing from another vendor). By requiring sequential prize drawings, PASS has ensured that everyone has a fair chance at winning prizes from every vendor. This also results in a throng of people that make their way to each vendor booth for the prize drawings. It's great fun! Back in the vendor hall, I was hoping to score an iPad 2 (thank you brilliant marketing folks at Apple). Considering the fact that I had already won the HP Mini, I really didn't expect to win anything. I was one of the first people to reach the CA booth (I had been at the very back of the crowd at the previous vendor booth), so I walked right up to the prize table and started looking over the box for their grand prize (a Samsung Galaxy Tab 10.1 - 32GB). I got some funny looks from the ladies in the CA booth, so I explained that I was just looking at the specs. As their looks continued, I joked "You should just take my picture now and get it over with." They laughed, I laughed, and I put the box back on the table. CA had a couple books up for prizes as well, and they drew names for those first. Then they called my name for the Galaxy Tab. I threw my arms up, jumped in the air and shouted "YES!" The nice ladies that had given me funny looks before now wore a new expression on their face, pure shock. I was so excited that I forgot to actually hold up the box for the tablet when they went to take my picture (I finally did at their request). Oops, sorry CA! After the vendor prize drawings were complete, I headed to a SQLCAT session on HA and Always On technology in SQL Server 2012. Very exciting stuff coming in the next release of SQL Server. I hit Gameworks Thursday evening for the Community Appreciation Party (sponsored by PASS and Microsoft). Playing video games, eating food, and hanging out with other SQL geeks consumed the evening very quickly! Things started to wind down on Friday with a steady exodus of people all day. Many thanks to my employer for allowing me to attend the PASS Summit in its entirety. Again, I got up early on Thursday to head down to the hotel lounge for #PASSPrayers. It was another great time of worship, prayer and fellowship. After breakfast I made my way to the keynote by Dr. David Dewitt. Wow! Wednesday's keynote was cheesy. While Thursday's keynote was better, it still didn't completely hold my interest. However, Dr. Dewitt's keynote on Friday was phenomenal! I actually left the keynote really excited about big data (which is not something I have any opportunity to work with). Dr. Dewitt's presentation was riveting and you could just feel the excitement in the room as everyone seemed to click with what he was saying. This is the perfect example of having the right person for the keynote. Dr. Dewitt knows his stuff, was able to provide a lot of detailed information, and kept it engaging at the same time. I would much rather listen to subject matter experts at a keynote than marketing teams. After the awesome keynote, I hit Brad McGehee's session "Inside the SQL Server Transaction Log". The session was fascinating and I brought more notes back for further research. Brad (Director of DBA Education @ RedGate - Blog - @BradMcGehee on Twitter) underwent quite the transformation after the PASS summit pursuant to RedGate's announcement about sending a DBA into space. Congrats to Joe Miller (@gajarga on Twitter) on winning the DBA in Space contest! I grabbed a quick lunch and then made my way to the PASS Board of Directors Meet and Greet. It was a great time of Q&A and a few complaints (at least one of which was just a bit misguided), but overall it was an awesome chance to meet the PASS BoD and gain insight into their vision for the organization. I left more excited about PASS as a whole and had more of a desire to contribute to the SQL Server community. The afternoon brought me to a session by John Sterrett (Blog) on utilizing Policy Based Management and Central Management Server to oversee a large SQL Server infrastructure. John posted some of the feedback comments on his blog (he even posted one of my comments, and called me out for my honesty). I found the session very interesting, but through no fault of John, my brain shut down about 3/4 of the way through. I had just had enough for one week. John obviously knew his stuff and I still have tasks to follow up on back at the office. With the condition of my brain, I decided to skip the last session of the day (Thomas LaRock's session on managing SQL memory - sorry Tom!). Instead, I wandered around and ended up talking to a lot of different people. I talked with Pinal Dave (@PinalDave on Twitter - I read his blog ALL the time), Rick Morelan (founder of Joes2Pros - @RickAMorlean and @Joes2Pros on Twitter - he has more certifications than you can shake a stick at), Brent Ozar, and a host of other people. I wrapped up Friday by hitting Ivar's Seafood with my college buddy. I do so love crab legs! 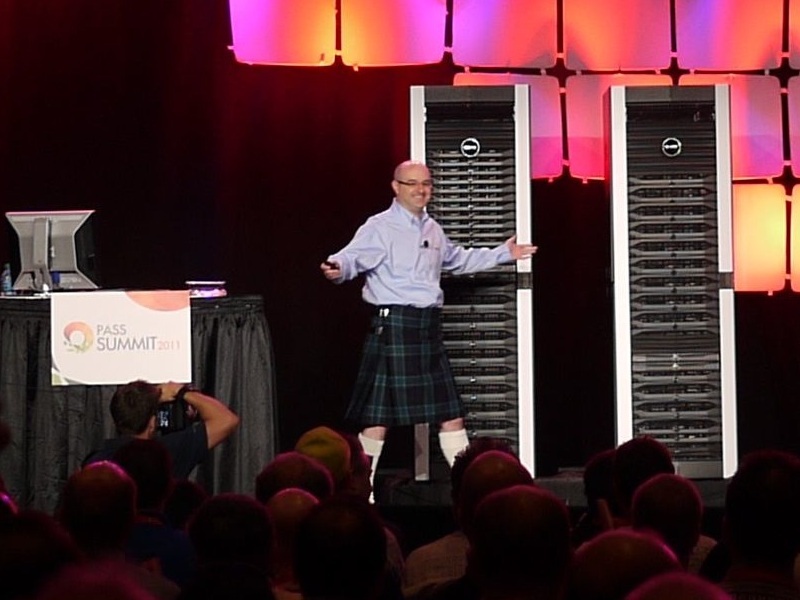 The PASS Summit is a must attend event for any SQL Server professional. There just isn't anything that can match PASS's caliber of content, networking, and community. If you're serious about your work with SQL Server, you need to attend this event. Be sure to also join your local chapter if you're not already a member. Also, be sure to pace yourself. I attended both pre-con sessions, so I had a completely full week. Be sure to get enough rest to go the distance. Thank you Kathi Kellenberger for being my big sister/Aunt through the PASS First Timer's program. And thanks for interviewing me for your Summit First Timer Follow-up blog post. Many thanks to all the hardworking folks at PASS for a job well done! I look forward to attending the Summit again next year.